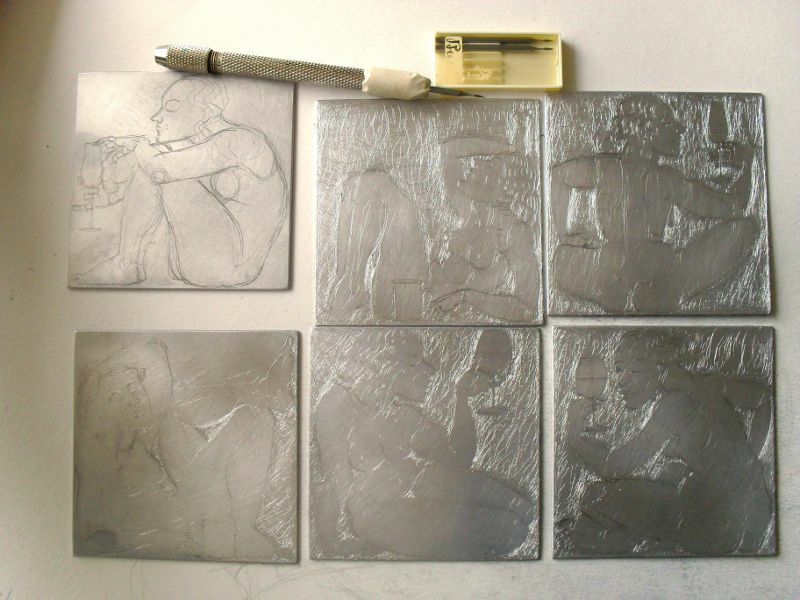 These are all drypoint prints - the artwork is created by scratching a picture into a metal plate (see the second illustration). After this the plate is inked up, wiped to remove just the right amount of excess ink (an art in itself), and printed on archival printing paper. The printing process wears down the fragile image scratched into the surface, so that only a few prints are possible. There were twelve of each image printed. At time of posting this I have one or two complete sets left and a few individual coasters, if you are interested in purchasing any (singly or as a set) please email me for availability and prices. Click the picture thumbnails to see more information about each individual image.